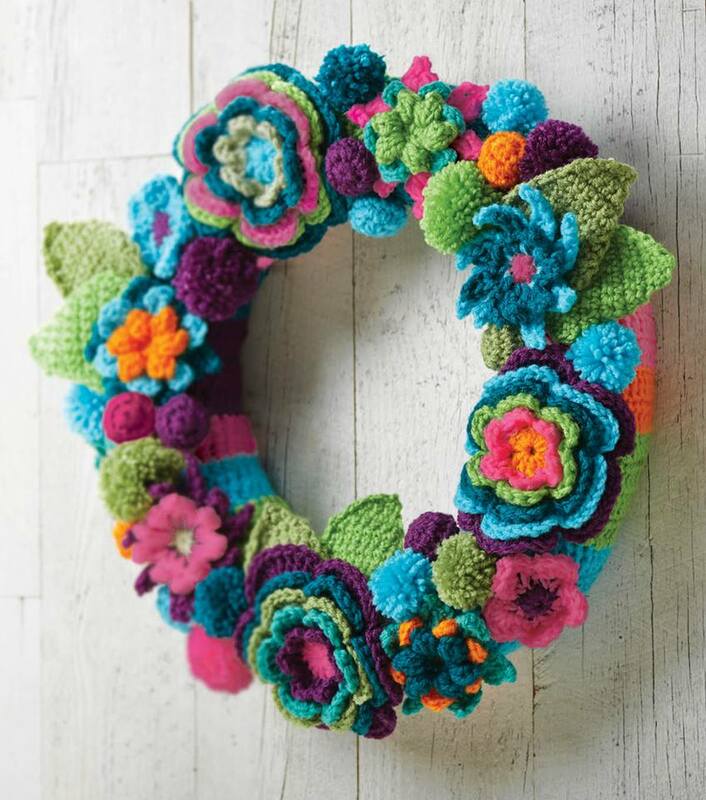 Crocheted Floral Wreath ~ Fun Food Life! Note: Colors are not assigned in the directions so you can determine what colors are best for your wreath. Row 1: Ch 30, dc in 4th ch from hook, dc across. Row 2: Ch 2, dc in each stitch across. Repeat row 2, randomly switching colors, until the length can be wrapped around the straw wreath. Wrap the piece around the wreath and sew the ends together. Then sew together the length of the piece to enclose the wreath. Keep the seams to the front of the wreath, as they will be covered by the flowers. Round 1: 11 dc into 3rd ch from hook, join with sl st to top of beginning ch 3. Round 2: Join next color into top of dc from last round. *Ch 2, dc 1 into dc st, (dc 1, ch 2, sl st) into next dc st, repeat from * 6 times. Round 3: Join next color and working behind row 1, work 1 sl st into previous row stitch. *Ch 4, 1 sl st in stitch between next petal, repeat from * 5 times. ch 4, sl st to 1st sl st to close. Round 4: Sl st into 1st ch sp, *2 ch, 3 dc, 2 ch over each 4 ch loop space. Cut yarn and fasten off. Round 5: Join next color and working behind round 3, work 1 sl st into stitch between petals, *ch 5, 1 sl st in stitch between petals, repeat from * 5 times, ch 5, sl st to 1st sl st to close. Round 6: sl st into 1st chain sp, *2 ch, 5 dc, 2 ch over each 5 ch loop. Cut yarn and fasten off. Round 7: Join next color and working behind round 6, work 1 sl st into stitch between petals, *ch 6, 1 sl st in stitch between petals, repeat from * 5 times, ch 5, sl st to 1st sl st to close. Row 9: sl st into 1st chain sp, *2 ch, 7 dc, 2 ch over each 5 ch loop. Cut yarn and fasten off. Row 10: Join next color and working behind round 8, work 1 sl st into stitch between petals, *ch 7, 1 sl st in stitch between petals, repeat from * 5 times, ch 5, sl st to 1st sl st to close. Row 11: sl st into 1st chain sp, *2 ch, 9 dc, 2 ch over each 5 ch loop. Cut yarn and fasten off leaving a long tail for sewing. Beg popcorn Ch 3, 4 dc in same space, drop loop, insert hook, from front to back, in top of beg ch-3, pick up dropped loop and pull through. Popcorn 5 dc in same space, drop loop, insert hook, from front to back, in top of first dc, pick up dropped loop and pull through. Cluster Yo, insert hook in next st or space, draw up a loop, yo and draw through 2 loops on hook, (yo, insert hook in same st or space, draw up a oop, yo and draw through 2 loops on hook) twice, yo and draw through all 4 loops on hook. Picot Ch 3, slip st in 3rd ch from hook. Round 2: Beg popcorn in first st, ch 1, *popcorn in next st, ch 1; repeat from * around, join with a slip st in top of first beg popcorn – 6 popcorns; 6 ch-1 spaces. Fasten off. Round 3: Join B (Ch 3, cl, ch 3, slip st) in same space, (slip st, ch 5, slip st) in next ch-1 space, *(slip st, ch 3, cluster, ch 3, slip st) in top of next popcorn, (slip st, ch 5, slip st) in next ch-1 space; repeat from * around, join with a slip st in first slip st. Fasten off. Round 4:With right side facing, join C with a slip st in any ch-5 space, *[ch 3, cluster, picot, ch 3, slip st] twice in same space, ch 1, (slip st, ch 3, cluster, picot, ch 3, slip st) in next ch-5 space, ch 1, slip st in next ch-5 space; repeat from * around, placing last slip st in same space as first leaf. Fasten off. With I one color, ch 5; join with slip st in first ch to form ring. Round 1: (right side): Ch 1, 10 sc in ring; join with slip st in first sc. Fasten off. Round 2: With right side facing, join next color with sc in any sc, ch 2, sc in same sc as join; slip st in next sc, [(sc, ch 2, sc) in next sc, slip st in next sc] 4 times; join with slip st in first sc—10 sc and 5 ch-2 spaces. Round 3: Ch 1, sc in same sc as join, (hdc, 3 dc, hdc) in next ch-2 space (first petal made), sc in next sc, slip st in next slip st, sc in next sc, (hdc, dc, 2 tr, dc, hdc) in next ch-2 space (second petal made), [sc in next sc, slip st in next slip st, sc in next sc, work first petal in next ch-2 space] twice, sc in next sc, slip st in next slip st, sc in next sc, work second petal in next ch-2 space, sc in next sc, slip st in next slip st, sc in next sc; join with slip st in first sc—5 petals. Fasten off, leaving 12″ (30.5 cm) tail for sewing. Round 1: 8 sc in 2nd ch from hook, slip st in first sc to join – 8 sc. Round 2: *Ch 6, sc in 2nd ch from hook, sc in next ch, hdc in next ch, dc in next 2 ch, sc in next st; repeat from * 7 more times, slip st to first ch – 8 petals. Round 1: 6 sc in 2nd ch from hook, slip st in first sc to join – 6 sc. Round 2: *Ch 4, sc in 2nd ch from hook, hdc in next ch, dc in next ch, sc in next st; repeat from * 5 more times, slip st in first ch – 6 petals. Sew Inner Petal in center of Outer Petals. Row 1: Ch 2, sc in second ch from hook. Turn. Row 2: Ch 1, sc in same sp as ch, sc in next st. Turn. Row 3: Ch 1, sc in same sp as ch, sc in each st across. Turn. Row 4-10: Repeat Row 3. Each row should increase by one stitch. Row 11: Ch 1, sc in each st across. Turn. Row 12: Ch 1, *sc2tog, sc in next 2 sts, repeat from * to end of row. Turn. Row 13: Ch 1, *sc2tog, sc in next st, repeat from * to end of row. Turn. Row 14: Ch 1, *sc2tog in each st to end of row. Tie off leaving a long tail for sewing. Row 1: Ch 2, 8 sc in second ch from hook. Row 2: Ch 1, 2 sc in each sc of previous round. Row 3: Ch 1, 1 sc in each sc of previous round. Row 4: Ch 1, sc2tog in each sc of prevous round. Fasten off leaving a long tail. Stuff bobble with leftover scraps of yarn. Weave tail through the top of each sc2tog and pull to close. Sew the leaves, followed by the larger flowers onto the wreath first, spacing as desired. Then add smaller flowers evenly around and sew each in place. Using pompoms and bobbles, fill any empty space on the wreath by sewing in place.